Here is another French Easter activity for you to do with your children. 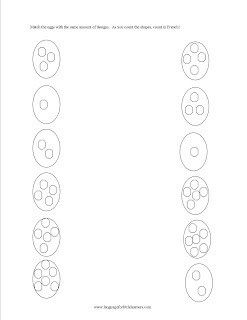 Print out the Easter Basket I found on another site. 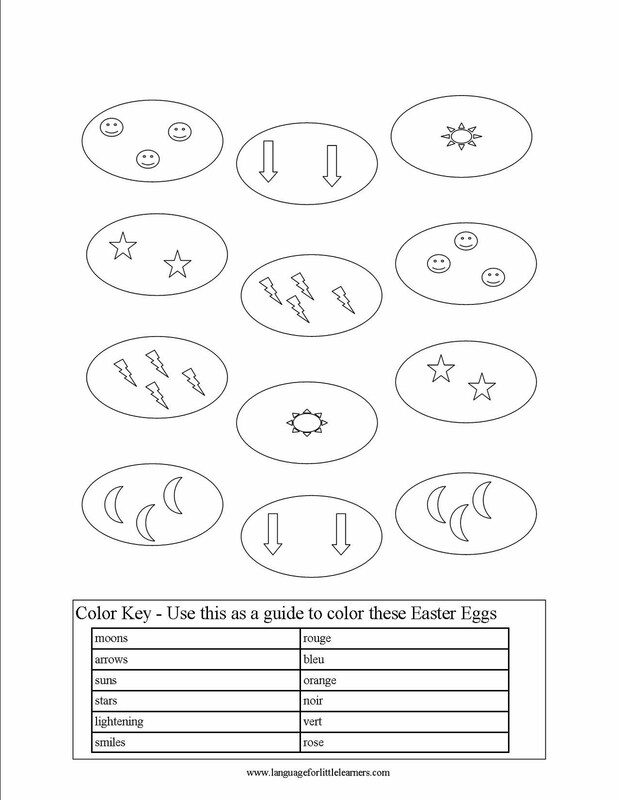 Write out the names of the different French colors on each egg. 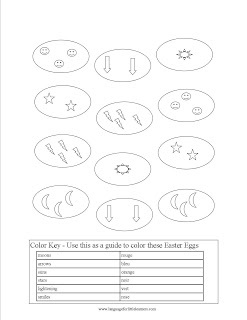 Then, use the other worksheet I made of eggs. Have your children color those eggs and cut them out. Then, they can paste the correct egg on the correct egg in the basket. If they are not yet reading, you can read the word to them. 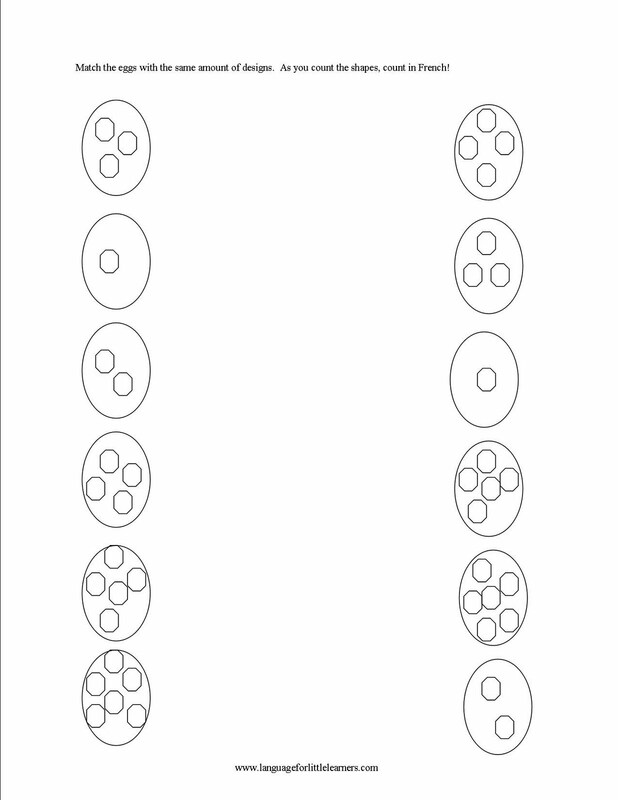 In order to print out the pages, just double click on the picture and it will bring put it in another window where you can print it out. My motto with homeschooling is to run with whatever works. What worked was the felt dolls. So, today I practiced listening comprehension with my kids. I told them how to dress the dolls in French and then they had to dress the dolls correctly. We also reversed this and they had to tell me how to dress the dolls in French. I turned my back so that they couldn’t see what I was doing. It made it more fun for them to see if mom would get it right. Then, when daddy got home from work, we let him join in the action. A simple, yet very effective way to teach French clothing words. You can also do this with felt faces and different color eyes, mouths and hair. 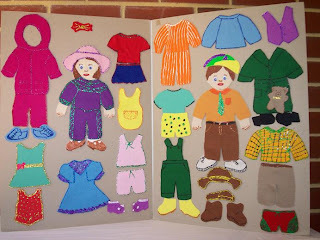 A really fun thing I did with my kids this weekend was to cut out a few dolls and clothes from felt. Felt is kind of hard to cut for kids, so I did most of that work, but they got to design the clothes. Felt is really neat because it stick to other felt. Thus, you can play ‘paper dolls’ but with your felt dolls. While you do this you can practice clothing words in French. First, you can have your children decorate the clothes you cut out with glitter, markers, fake jewels or anything you can think of. Then, afterwards you can do different role playing games or just change the clothes and mix and match outfits. Make sure they practice their French the entire time! I think your kids will really enjoy this activity. And, felt is really cheap to buy. You can find it at Wal-mart or Michael’s. Today, I played a fun little game with my daughter. I had some pre-made cookie dough and put it on the cookie pan and then I told her what shape of cookie she was to make, in French. She had so much fun making the different shapes. After we cookies them she told me their shapes in French before eating them. We used Peanut Butter cookie dough because that was what we had, but you could use sugar cookie dough and they could decorate them afterwards. That way you could practice the colors in French, as well as the French words for shapes. 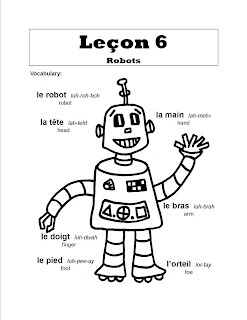 Here are a few pages example pages of my French for Little Boys Workbook. This book has 50 activities to teach your son (or daughter) French. Although it’s for ‘Boys,’ girls who like trains, cars, animals and robots would like this workbook as well. Please let me know if you have any questions! 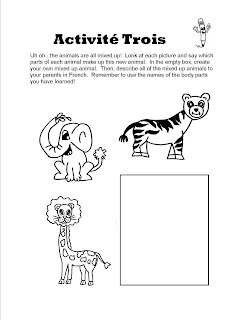 Here’s a French Easter egg worksheet I made for my children today and I hope you find it useful. It has a color key in French and they can color the eggs according to it. 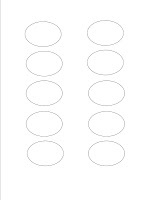 Also, you can have them count the eggs and designs in French. I think it’s important to use the current holidays in order to motivate children to learn a foreign language. Enjoy! 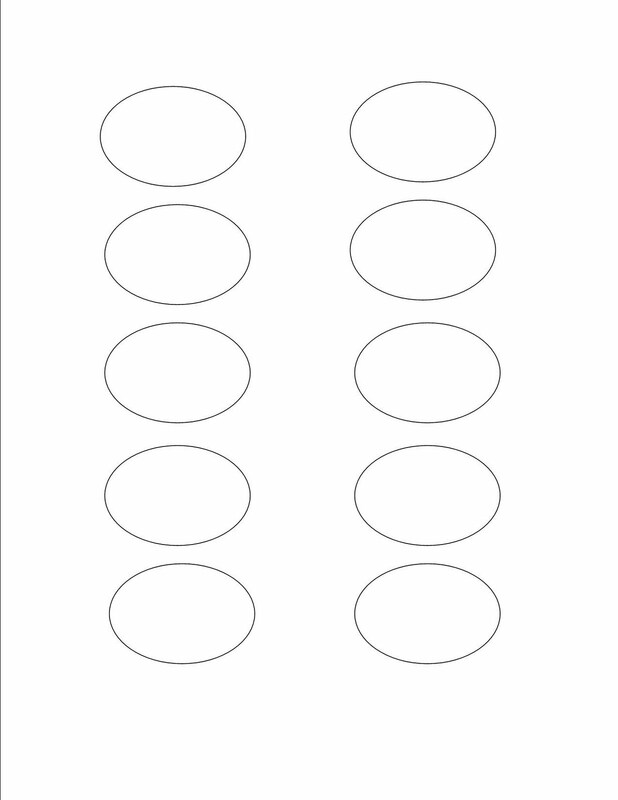 Here’s an Easter worksheet that I made which you can use to help your children practice their numbers in French! After they finish matching the eggs with the same numbers, you can tell them different colors in French which they can color the eggs. Some days I just get to where I want to goof off all day. Today was one of those days. I did it, but in a fun and educational way. We had the Jelly Bean Olympics. 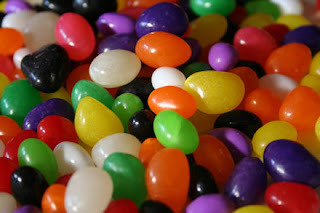 We had silly games using jelly beans and the whole time I made the kids speak French. One game was a jellybean relay where each kid had to have a spoon with 1 jelly bean and then run the distance of the yard, the other child was then shouting out the number in French, then we switched kids and added a jelly bean. The other child now had to yell out the number in French. We also yelled things like, “Cours!” (run) and “vite!” (quickly). We also had a jelly bean toss where I laid different colors of construction paper on the ground and they had to toss their jelly beans to the right color of paper. So, if they had a blue jelly bean then they had to throw it on the blue piece of paper. (Of course they had to use their French and say which color they had. We tried to balance jelly beans on our noses, but that wasn’t very successful, but it did bring a lot of laughs! And what do you think we did at the end? Yup, we ate a bunch of jellybeans! All and all a good day!